What is the right amount to give? Does the tithe still apply to today? Is the first 10% required and everything else is a free will offering? What should be our motivation for giving? There has been plenty of debate about these questions, but the author shares how the instructions in the Bible focus more on the heart of the matter rather than following a specific set of rules. He gives a different perspective on giving, and has good insight into what makes our gifts acceptable to the Lord. 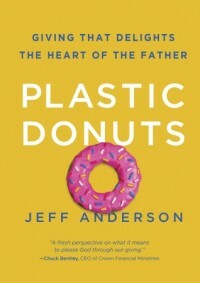 The author uses an illustration of the pleasure his little girl showed when she gave him a plastic donut and he took it at "ate" it. There are numerous times when I have played with little plastic donuts as a result of my children's pretend restaurant or kitchen. So, I understand what the author is saying. I recall the delight on my children's faces when they served the food to me and I would pretend to eat it. This type of pleasure seen in our children should be the same as when we give our gifts to the Lord. If we are genuinely pleased to give to Him, then He is genuinely pleased with our gift. This, in turn, brings us closer to the Lord in our relationship with Him.